Right now, residents living at the Sunrise Tower apartments say they are fed up with temporary fixes to dangerous living conditions. 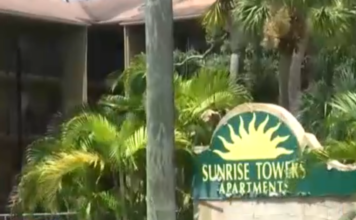 A fresh start is what many people living at Sunrise Towers say they’re hoping for as more code violations pile up on the apartment complex. Residents are seeing no progress. In July, code enforcement deemed all five of the staircases at Sunrise Towers unsafe and condemned two after on collapsed. Since July, contractors made some improvements to one of the open stairwells , but the City says no new permits to fix the others were filed. Tannayjah Addison says these repairs are a quick fix, just like the mold cleanup in her apartment. “They only came and they scraped and they painted and it’s coming straight back through the paint,” she said. She says her neighbors are also dealing with mold, pests and safety issues. Right now the City says 17 code cases are still open against Sunrise Towers, and they have racked up nearly $60,000 in code fines. The City says a new complaint was also filed last month and Sunrise Towers will have a few new fines on the 13th if the owner doesn’t make necessary fixes.